Okay back to today as I'm still a few days away from escaping this Autumnal weather! 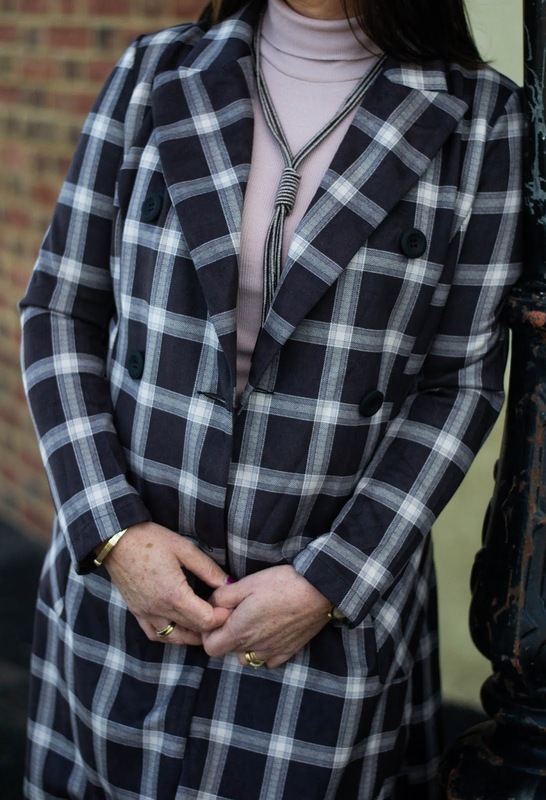 I was recently contacted by Krisp Clothing, & from their exciting collection of fashion garments I was asked to select a few pieces - this cute jacket caught my eye immediately. 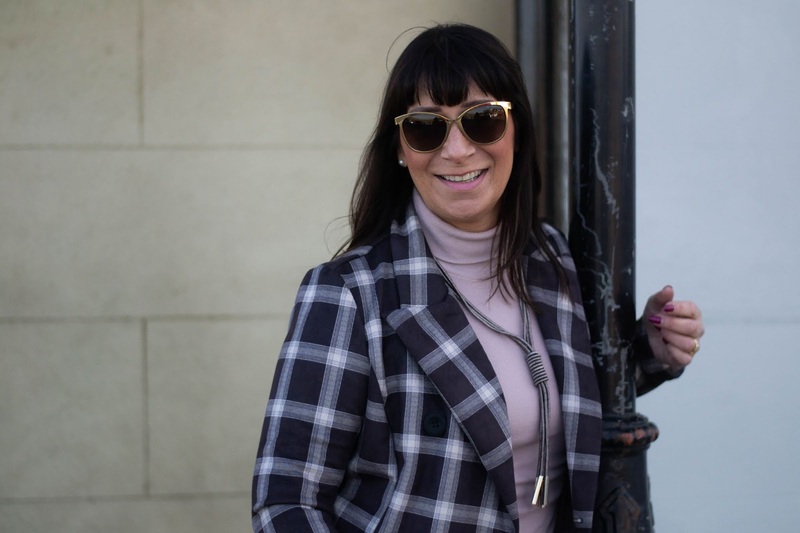 Check/plaid pieces are everywhere this season, so it felt right to include this in my top pick! I've worn it over a pale mink roll neck jumper, also choosing white jeans to pick out the white check detail. 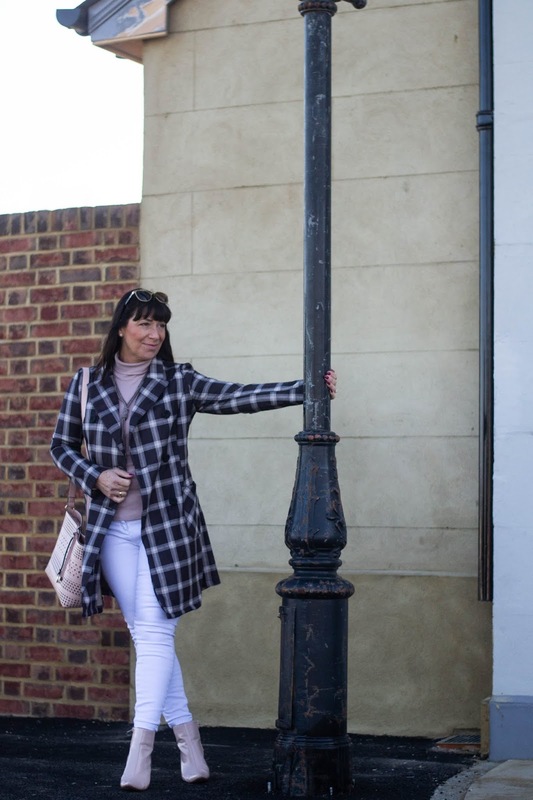 Isn't this just right for a stroll through the shops and a catch up lunch with friends? Easy to wear and just as easy to look great in. A neutral jacket calls for muted bag and boots, so this is where my blush pointed toe boots and lotus bag came in handy. Both have complimented so many of my outfits since I took ownership. The double breasted jacket has a stylish but formal peak lapel & a tie belt which I felt looked super fastened at the back. But my favourite addition has got to be the pockets, you all know how much I like pockets on clothes, these are fabulous for car keys which I can never find in my bag - "over fifty memory problems" - lol! Time to party... it's #chicandstylish #linkup time. Who's favourite from last week? 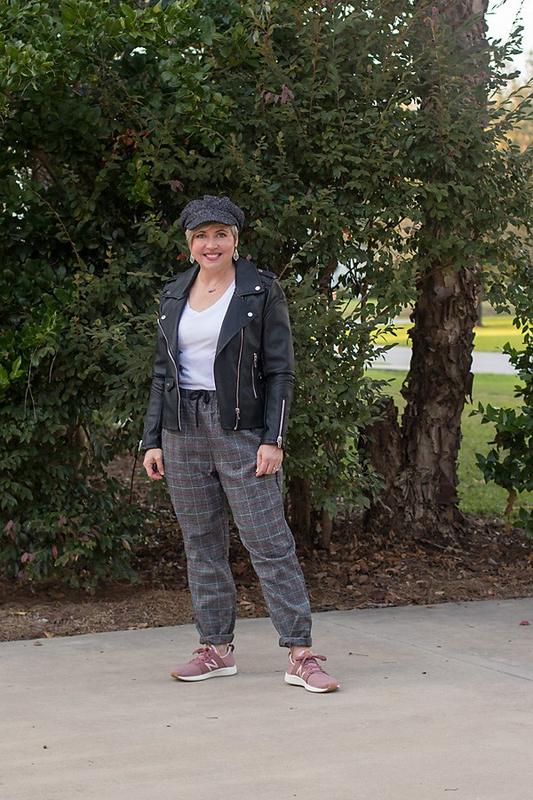 Fonda from Savvy Southern Chic wowed us with her moto jacket, check trousers and fabulous Bakerboy cap. A little different from what you'd normally find her wearing, but I think she looks fabulous don't you? Please do pop over and checkout her blog. Thanks for stopping by today - much appreciated. This is such a fresh look for autumn. Beautifully styled Jackie. That jacket is fabulous! It definitely would be a touch choice between the charcoal and pink. I love it styled with the white jeans. That is a sharp looking jacket. Thanks for featuring me. This is such a stunning fall look. The check jacket is everything. Jacqui, this might be one of my favorite outfits ever that you have shared on your blog! You are sassy, my friend, and super chic! Love this jacket and the blush and white tones that you paired it with. So good! Have a wonderful vacation! Abu Dhabi!! So exciting! What fun to pack for such a trip! I'm excited for you too, haha! Well I hope you have a great trip! I love your jacket - the colors and the plaid and of course how you styled it - so pretty! That's a great jacket and it looks so nice with the light neutrals underneath. That's a beautiful jacket! And you styled it beautifully! Looking amazing! And how wonderful that you have vacation to look forward to! It sounds amazing. You're going to have a wonderful vacation, Jacqui!! that jacket it just gorgeous!! This coat is a real statement piece, but at the same a great classic with a twist. Smart choice. Jacqui, I LOVE this color palette on you! gorgeous. The plaid jacket is so sharp, you will be wearing often, i bet. Love the white jeans as it really makes the look pop. 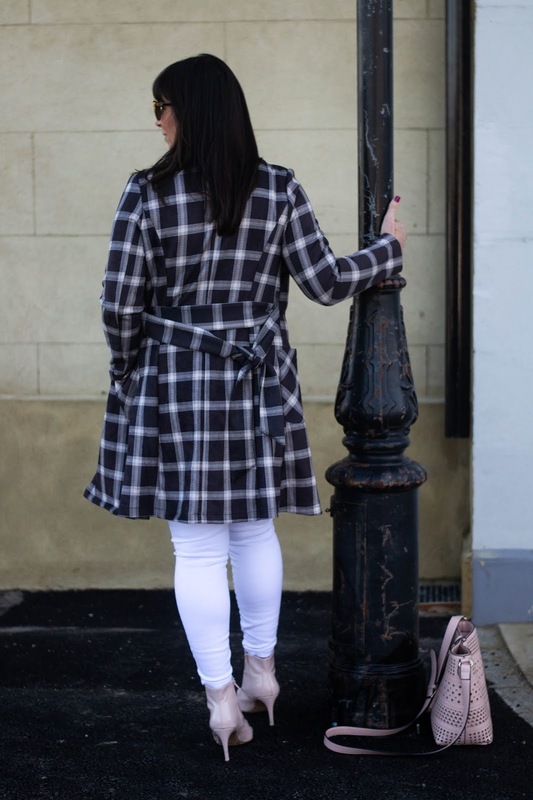 Love the plaid coat and how you've styled it with white jeans. Have a fantastic trip to Abu Dhabi! LOVE your jacket and booties! Have fun on your vacation! How exciting! I LOVE that plaid coat, and you have styled it perfectly with the white jeans and lavender turtleneck. I've been to Dubai but didn't get to Abu Dhabi, so I will be seeing it from your view! Ohh, enjoy your fabulous trip! Yes, it is so much harder to prepare and pack for a trip after having kids. Even if it is a trip we're not taking them on, it's still just hard to find the time in-between all their activities, etc. I hope you have a great time! 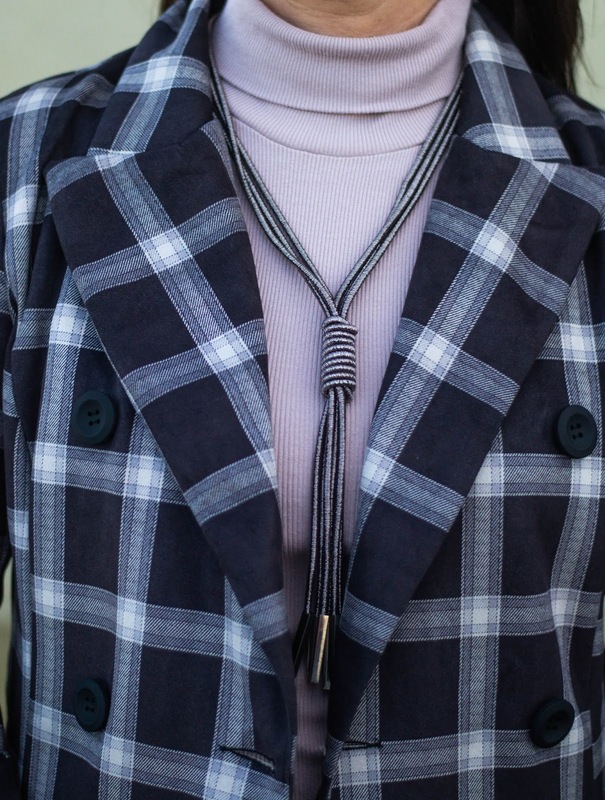 I just love this plaid jacket on you and that striking necklace! Love the booties, too! That jacket is amazing! It looks fantastic on you! Have a wonderful trip! Fabulous jacket! It looks very chic with the rollneck top. Hope you have a wonderful trip to Abu Dhabi!